Get Exclusive Deals and More with New ESO Plus Rewards! We are thrilled to announce a series of brand-new updates to ESO Plus™, providing even more value to current members. Read on to find out what new rewards are coming to ESO Plus soon! ESO Plus already provides a host of incredible benefits to its members, including access to every current and future in-game DLC game pack, free crowns, the Craft Bag, and much more. However, starting November 13, you’ll be able to enjoy even more rewards for your membership, including exclusive Crown Store items and deals, free in-game collectibles, and an increase to the monthly Crown stipend. As an ESO Plus member, you will receive an additional 150 Crowns as part of your monthly stipend, bringing your total to 1650 per month. Note that if you are partly though a 3- or 6-month membership, you will be credited your bonus crowns by the end of November. With this update, ESO Plus members will be able to acquire free collectibles from the in-game Crown Store. The free items will only be available to ESO Plus members and will be indicated in gold text labeled “Free” next to the Chalice icon. Free items will be added to the Crown Store only on rare occasions and for a very limited time. 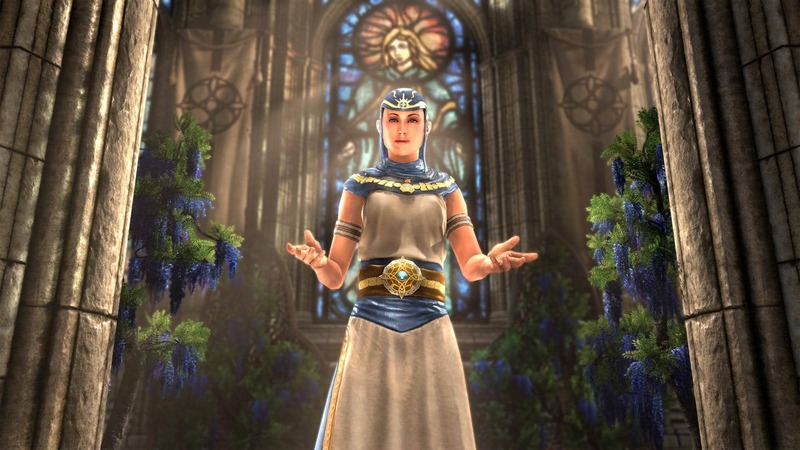 One of the free ESO Plus member-exclusive items includes a unique collectible: the Priestess of Mara costume. Note that the new costume will not be available immediately, but will arrive in the Crown Store later in the year. With ESO Plus membership-exclusive deals, you’ll be able to acquire select Crown Store items at a special, discounted price. The discounted items will be in the Crown Store with gold text and a Chalice icon. The items available at a membership-exclusive discount can change often (and some might only be available as part of a limited-time offer), so be sure to check the Crown Store on occasion to see what is available. In additional to unique deals, ESO Plus members will also gain access to exclusive Crown Store items. These exclusive items may be available for sale for Crowns or even free (as mentioned above). These items can include collectibles such as costumes, pets, mounts, and more, and will be identified by the gold text and Chalice icon. Like the exclusive deals, these items can change often, so be sure to keep an eye out. To help you keep track of what deals are currently available when new benefits arrive, you’ll be able to visit a new ESO Plus tab within the Crown Store UI. From there, you will be able to check your current benefits and review what Crown Store items are available on sale or exclusively to members. Note that it will not be possible to Gift an item acquired for free, purchased at a discount, or purchased exclusively due to your ESO Plus membership. However, you can still purchase items as Gifts at full price. With every new DLC release, ESO Plus gets better and better, and starting this November, we’ll be adding even more value for our members. Do you already enjoy ESO plus, or are you thinking about finally picking it up? Don’t forget, you can check out everything that’s currently available with ESO Plus and sign up on our website, and be sure to let us know your thoughts on the new and existing benefits on Twitter @TESOnline and Facebook!